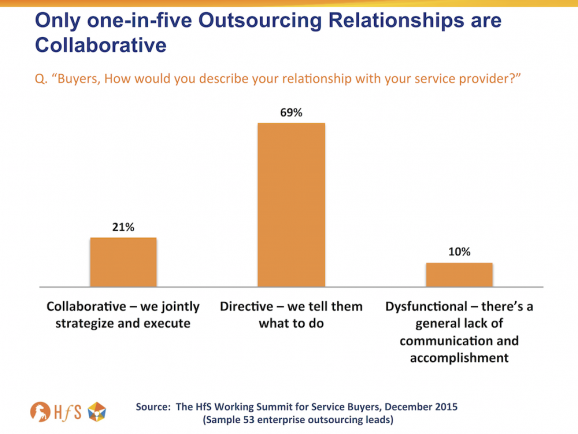 80% of outsourcing relationships fail to deliver collaborative value... so what can we do? Our theme for 2016 is all about us "getting back to basics" as a services industry, and nothing exemplifies this more than what the buyers and providers privately said about each other at the recent HfS Working Summit in Harvard Square. Once we get past all the talk of disruption and change, the real issue holding back progress is the simple fact that too many of today's services relationships are just not set up to be collaborative ventures. 1) Buyers need to entrust more higher-value work to their providers, with their leadership incentivizing their middle-managers to "let go". Many buyers consistently admit they need to entrust their provider with higher value work to improve the quality of their engagement. But this isn't really about trust, it's more about the buyer letting go and having the confidence to give their service provider more responsibility, which would make them more effective at their own jobs. Sadly, most middle-managers have absolutely no motivation to entrust more to their service provider -and, frankly, why should they? What motivation would you have to make yourself less dispensable to your firm? So it's up to their leadership to force the issue, either by demanding more work is outsourced, or by incentivizing their managers by giving them more motivating work to do... with real financial and career benefits to do so. 2) Automation is the "new offshoring", so leverage RPA to create renewed opportunities to collaborate. The next wave of value is blending global sourcing with the mimicking of manual processes in RPA software that are predominantly high throughout, high intensity tasks. All enterprises have varying potentials for real automation value to be created by robotizing rote manual tasks. And most of the respectable service providers have invested in capabilities to develop an RPA strategy for their clients. Buyers must learn from mistakes of the past to look beyond short term cost savings and create a broader intelligent automation strategy, which also creates significant opportunities to establish more collaborative, value-added relationships with their service partners. Moreover, it is in the interests of buyside managers to put automation capabilities on their resumés as CEOs increasingly demand a cohesive plan to create a more automated operating platform to support non-linear future growth for their firms. 3) Weave Design Thinking into engagements to shift the impetus towards mutually beneficial outcomes. The less hyped, but nevertheless creeping uptake of Design Thinking is helping several relationships inject lateral thinking and renewed motivation to work together, not only in the customer-facing front office, but also in the back office operational functions. Design Thinking in services is based, primarily, on both service buyer and provider coming together to create business outcomes that are mutually beneficial - and motivational - for both parties. However, this must be established as ongoing collaboration across all key relationship stakeholders, and not simply two days of senior management putting sticky notes on each others' foreheads. There must be senior pressure and buy in to adopt Design Thinking as a means to move away from Six Sigma-obsessed old world models, and really change the way the service buyer and provider teams work together. We're seeing encouraging signs from several providers aggressively promoting Design Thinking techniques, such as Infosys, IBM and Cognizant, into their engagements, but this is still restricted to far too few a number of buyers at this stage. But Design Thinking, and new creations of Design Thinking-eque collaborative methods are increasingly important ways to bring together new concepts and ideas, better teamwork, and ways to design outcomes jointly that can incporporate investments from both sides. This post sums up why the outsourcing business is struggling to move with times. Legacy deals set up at a specific point in history to fulfil a short-term need to save on labor costs. Without a real plan to change mindsets and evolve the roles of staff, there is no reason for most staff to do anything different. This isn't only outsourcing deals either; look at ERP deployments, where similar issues exist with staff similarly having no incentive to change the way they do things. Changing mindsets and behaviours is the challenge of 2016 and beyond! Phill, I understand the need to motivate the “buy” side middle manager to accept the change. But how do you change the selling side behaviour. How to motivate a senior sales director who has been selling bodies for last 20 years. As a service provider, what if I’m happy to be just a broker of efficiency as long as I can disguise it behind the colourful PowerPoint of RPA. What if as a customer, all I want is to get my work done at lower cost. Now it’s up to service providers how they deliver it. Some of them may just move operations from Bangalore to Manila or some may just take a hit on margins. And I hope there is one who can bring in a fully fledged RPA as a disruptive change, just like Ford did, and push old horses out of business. @Phil - Good data point on collaborative value delivery. But I think the challenge is on both buy and sell side. As much as service providers tend to remain as order takers, clients also need to take precautionary measures during the sales process to ensure that doesn't happen. In my 25 years of experience with top 3 service providers (US and India based), i have seen the buy side sometimes get overly prescriptive in their requirements leading to very little room for any collaboration. On the other side very few service providers actually make the best use of the opportunity, when there is a real need for developing collaborative value. The question is how do we "morph" both sides to be more collaborative in the future - right from the sales cycle? May be its time for the robots to show humans how to collaborate better ! Happy Holidays! @Balu - Great comment. I agree, the problem starts at the buy and sell side of the relationship. This is where a process such as Design Thinking can be very valuable to the selection and buying process. As clients become more familiar with the ups and downs of outsourcing, they should also think about how the process they follow to choose a provider. If the buying process included more interaction between the buyer and provider, and utilized collaboration or Design Thinking to identify a solution that best fits on both sides, before down-selection occurs, we would see more successful relationships. One important factor of taking this approach is both sides get to see what it would be like to work with each other, and each side would have a better understanding of what they can and cannot deliver.